VANDALIA — When Donnie Evers graduated from Wayne High School in 1977 and took a job with the Vandalia Service Department, little did he know that it would begin a lifetime of service to the community he calls home. 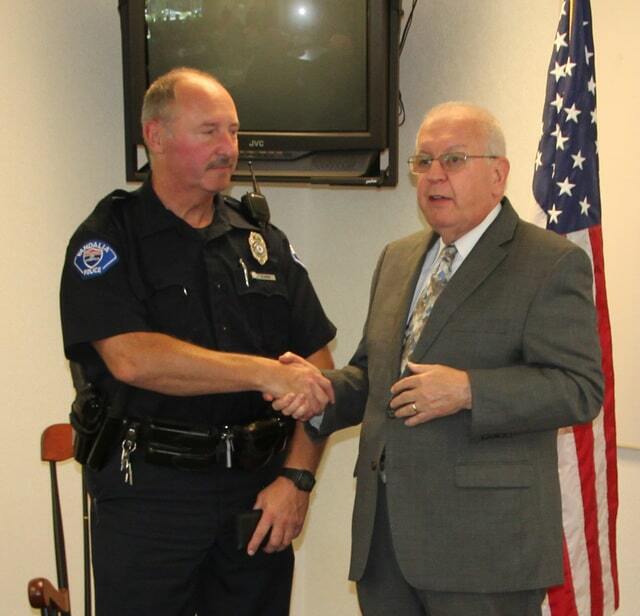 On Friday, Evers retired from the Vandalia Division of Police after a 34 year career as a police officer and 38 years overall to the City of Vandalia. Police Chief Douglas Knight presented Evers with a gold retirement badge during remarks at a gathering on Friday. Evers joined the police department as a reserve officer when he turned 21 years old. He served in that capacity for nearly three years while continuing to work full-time in the Service Department. In December, 1983, Evers was brought on full-time as a police officer. During his career, he served in various assignments including patrol officer, reserve officer, detective, Neighborhood Officer, and had a long tenure of managing the department’s fleet of vehicles. Evers said that the officers he served with will always be family. Evers won’t be far from that family for long, however, as he will be assuming a part-time position as a bailiff in the Vandalia Municipal Court. Knight concluded with a tribute to Evers’ career and work. “Donnie Evers has had a fine career, and has been salt of the earth in all he does, and he does them for the right reasons,” said Knight. Vandalia Police Officer Donnie Evers (left) received a gold retirement badge from Vandalia Police Chief Douglas Knight during a reception on Friday. Evers is retiring after 34 years of service to the police department and 38 years overall to the city. Mary Showers (left) and Debbie Steggemann (right) make a presentation to Officer Donnie Evers. A reception was held on Friday to honor Vandalia Police Officer Donnie Evers who is retiring from the department after 34 years of service.